Rock Hippo Productions Ltd. will be launching a fun-filled holiday update for the popular cartoon style third-person shooter, MicroVolts beginning December 16th. Santa’s sleigh will bring a sack full of holiday accessories, weapons and a slew of holiday events for players who’ve made the naughty OR nice list this year. 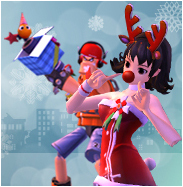 Making MicroVolts merry and bright, the upcoming Holiday Special Update will gift players with a variety of cool new holiday items including new Holiday Costume Bundles for Naomi and C.H.I.P that will have players rockin’ around the battlefield. In addition to the Santa-size sack full of holiday accessories and weapons, MicroVolts is also hosting a 12 Days of Christmas event and a Deck the Walls wallpaper contest! This seasonal contest will give players a glimpse at some of the all-new content coming up in the next update! This entry was posted on Monday, December 12th, 2011 at 11:29 am and is filed under National News, Shooters, Teen, Upcoming Releases. You can follow any responses to this entry through the RSS 2.0 feed. You can leave a response, or trackback from your own site.